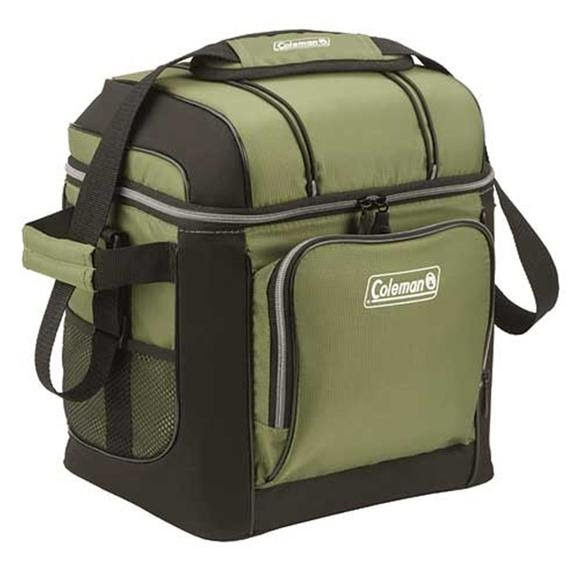 Keep everything cold at the ball field or campsite with the Coleman 30 Can Soft Cooler with removable hard liner. It's easy to carry, with side handles for more control or an adjustable, padded shoulder strap for more comfort. Four pockets and a bungee on top make packing up extra food, snacks and gear simple. Keep everything cold at the ball field or campsite with the Coleman 30 Can Soft Cooler with removable hard liner. It&apos;s easy to carry, with side handles for more control or an adjustable, padded shoulder strap for more comfort. Four pockets and a bungee on top make packing up extra food, snacks and gear simple. Antimicrobial, product-protecting properties are built into the flexible lining to resist odor, mold and mildew, making it easy to clean between uses. The soft liner is also made of FDA-approved food contact material, so it&apos;s safe to use with food and drinks. Use ice with the hard liner or ice substitutes without it; either way the heat-welded seams are going to prevent soft liner leaks. Measurements 12.2" x 9.65" x 13.78"